Note: cv2.split() is a costly operation (in terms of time). So do it only if you need it. Otherwise go for Numpy indexing. Note: If image is grayscale, tuple returned contains only number of rows and columns. So it is a good method to check if loaded image is grayscale or color image. Note: img.dtype is very important while debugging because a large number of errors in OpenCV-Python code is caused by invalid datatype. This includes bitwise AND, OR, NOT and XOR operations. They will be highly useful while extracting any part of the image, defining and working with non-rectangular ROI etc. We knew how to convert BGR → Gray in previous example. - BGR → HSV, we use the flag cv2.COLOR_BGR2HSV. 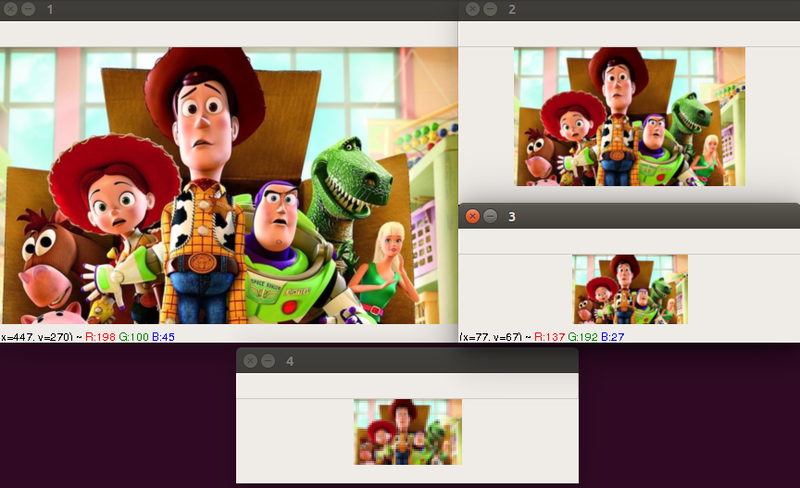 Apply BGR → HSV to extract red foreground of picture "opencv_logo.png". - Now extract the red object alone. Note: How to find HSV values to track? If pixel value is greater than a threshold value, it is assigned one value (may be white), else it is assigned another value (may be black). We used an arbitrary value for threshold value. This value was found by using trial and error method. - First argument is the source image, which should be a grayscale image. - Second argument is the threshold value which is used to classify the pixel values. - Third argument is the maxVal which represents the value to be given if pixel value is more than (sometimes less than) the threshold value. 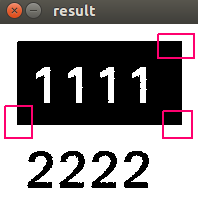 Because white background and "1111" have pixel values greater than threshold (127) so their values will be changed to threshold. The algorithm calculates the threshold for a small regions of the image. So we have different thresholds for different regions of the same image. This is useful for the image that has different lighting conditions (varying illumination) in different areas. The threshold value at each pixel location depends on the neighboring pixels. 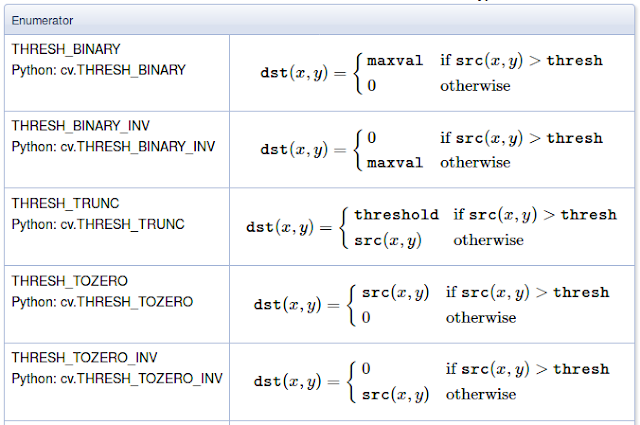 How thresholding value is calculated? - First calculating the mean or Gaussian weighted mean of neighborhood values using ADAPTIVE_THRESH_MEAN_C or ADAPTIVE_THRESH_GAUSSIAN_C. So the result is better than Global thresholding method. 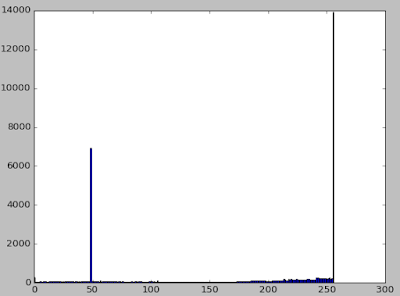 This method only applies for a bimodal image (an image whose histogram has two peaks). This method approximately takes a value in the middle of those peaks as threshold value. 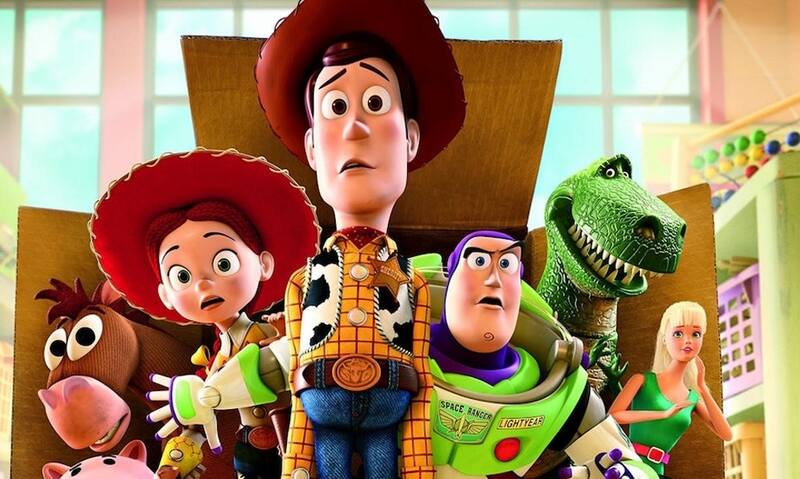 For images which are not bimodal, binarization won’t be accurate. We will use cv.threshold(), but add extra flag cv.THRESH_OTSU. That is cv.THRESH_BINARY+cv.THRESH_OTSU. Note: the value of retVal is optimal threshold. In this example it is 148. 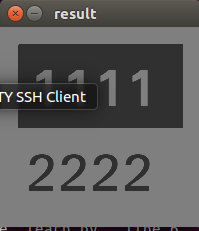 You can use it with THRESH_BINARY. It will give similar result to Otsu method. Images also can be filtered with low-pass filters(LPF), high-pass filters(HPF) etc. - LPF helps in removing noises, blurring the images etc. - HPF filters helps in finding edges in the images. 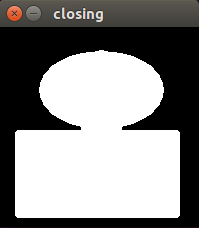 In OpenCV, we use cv.filter2D() to convolve a kernel with an image. The result shoul be similar to Otsu method. Image blurring is achieved by convolving the image with a low-pass filter kernel. It is useful for removing high frequency content (eg: noise, edges) from the image. 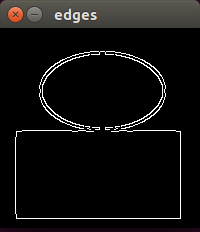 So edges are blurred a little bit in this operation. OpenCV provides mainly four types of blurring techniques. Reuse the example above but using 5x5 normalized box filter. The result should be similar to example above. Instead of using box filter, using gaussian kernel. Gaussian blurring is effective in removing Gaussian noise from the image. - The width and height of kernel which should be positive and odd. - The standard deviation in X and Y direction, sigmaX and sigmaY respectively. If both are given as zeros, they are calculated from kernel size. - A Gaussian kernel can be created with cv.getGaussianKernel(). Reuse the example of Otsu method. This is effective against salt-and-pepper noise in the images. 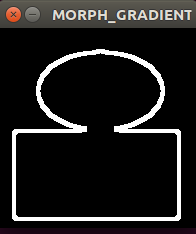 It takes median of all the pixels under kernel area and central element is replaced with this median value. Its kernel size should be a positive odd integer. 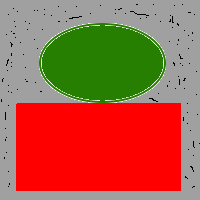 In the above filters, newly calculated central element may be a pixel value in the image or a new value. But in median blurring, central element is always replaced by some pixel value in the image. It is effective in noise removal while keeping edges sharp. The operation is slower compared to other filters. - Gaussian filter in space make sure only nearby pixels are considered for blurring. - Gaussian function of intensity difference make sure only those pixels with similar intensity to central pixel is considered for blurring. So it preserves the edges since pixels at edges will have large intensity variation. 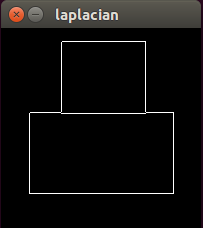 After running this code and notice the edges of black square you will see the difference comparing to other filters. Morphological transformations are some simple operations based on the image shape. It is normally performed on binary images. It needs two inputs, one is our original image, second one is called structuring element or kernel which decides the nature of operation. It erodes away the boundaries of foreground object (Always try to keep foreground in white). 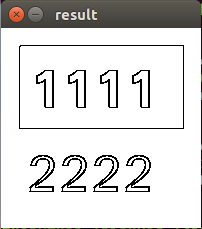 When the kernel slides through the image, a pixel in the image (1 or 0) will be 1 if all the pixels under the kernel is 1, otherwise it is 0 (eroded). 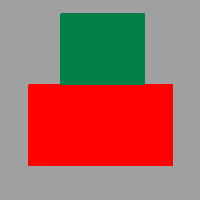 With this rule, all the pixels near boundary will be discarded depending upon the size of kernel. So the size (thickness) of the foreground object decreases (white region decreases in the image). 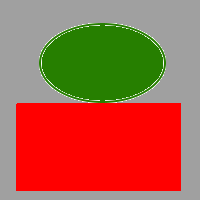 Erosion is applied to remove small white noises, detach two connected objects. It is opposite of erosion. 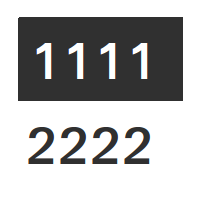 A pixel element is '1' if at least one pixel under the kernel is '1'. 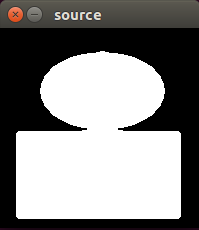 It increases the size of foreground object (white region in the image). In cases like noise removal, erosion is followed by dilation. Because, erosion removes white noises, but it also shrinks our object. So we dilate it. It is also useful in joining broken parts of an object. Opening is erosion followed by dilation. It is useful in removing noise. Closing is reverse of Opening, Dilation followed by Erosion. It is useful in closing small holes inside the foreground objects, or small black points on the object. It is the difference between dilation and erosion of an image. 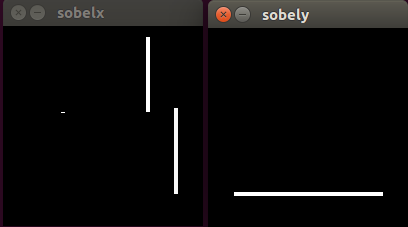 We manually created a rectangular shape kernel in the previous examples with help of Numpy. But if you need elliptical/circular shaped kernels, you can use OpenCV function cv.getStructuringElement(). Just pass the shape and size of the kernel, you get the desired kernel. Support to find Image gradients, edges. OpenCV provides three types of gradient filters or High-pass filters: Sobel, Scharr and Laplacian. 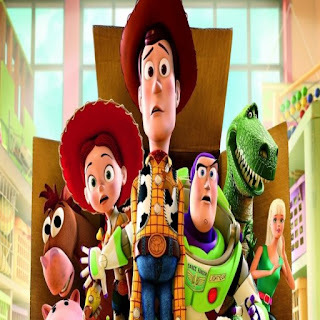 - The direction of derivatives to be taken (vertical or horizontal by the arguments). - The size of kernel by the argument ksize. If ksize = -1, a 3x3 Scharr filter is used which gives better results than 3x3 Sobel filter. 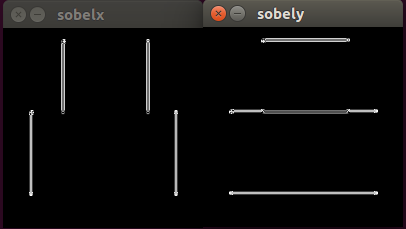 You can see that Sobel in X detects edges following X direction, Sobel in Y detects edges following Y direction. But the results missed some edges. The reason is that output datatype is uint8 (check by using print(sobelx.dtype)). Moreover Black-to-White transition is taken as Positive slope (it has a positive value) while White-to-Black transition is taken as a Negative slope (It has negative value). 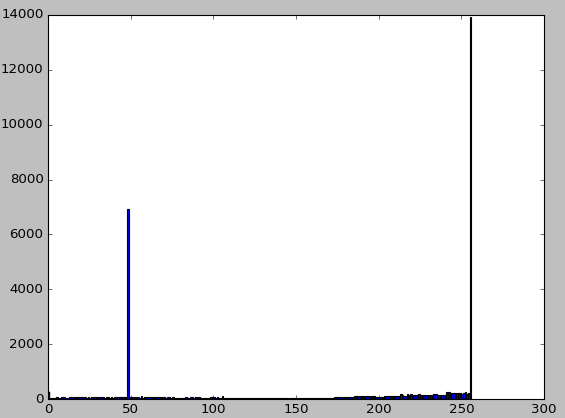 So when you convert data to np.uint8, all negative slopes are made zero. So you miss that edge. In order to fix it, you need to upgrade the output datatype to some higher forms (cv.CV_16S, cv.CV_64F), take its absolute value and then convert back to cv.CV_8U. Laplacian Operator is also a derivative operator which is used to find edges in an image. The major difference between Laplacian and other derivative operators like Prewitt, Sobel, Robinson and Kirsch is that these all are first order derivative masks but Laplacian is a second order derivative. where each derivative is found using Sobel derivatives. + Edge detection is susceptible to noise in the image, first step is to remove the noise in the image with a 5x5 Gaussian filter. + Finding Intensity Gradient of the Image. Gradient direction is always perpendicular to edges. + Non-maximum Suppression: after getting gradient magnitude and direction, a full scan of image is done to remove any unwanted pixels which may not constitute the edge. Every pixel is checked if it is a local maximum in its neighborhood in the direction of gradient. If so, it is considered for next step, otherwise, it is put to zero (suppressed). Point A is on the edge. 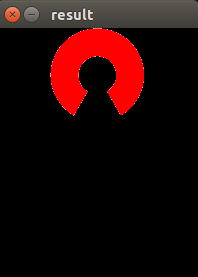 Gradient direction is normal to the edge. Point B and C are in gradient directions. So point A is checked with point B and C to see if it forms a local maximum. + Hysteresis Thresholding: decides which edges are really edges or not. For this, we define two threshold values (minVal and maxVal). 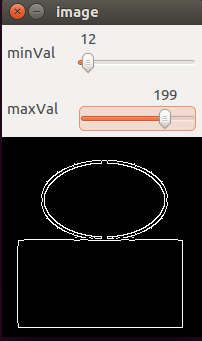 Any edges with intensity gradient greater than maxVal are sure to be edges and those smaller than minVal are sure to be non-edges. 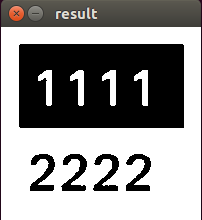 For edges between these two thresholds, if they are connected to "real-edge" pixels, they are considered to be part of edges. Otherwise, they are also non-edges. 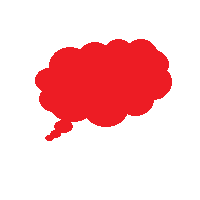 + First argument is our input image. + Second and third arguments are our minVal and maxVal respectively. + Third argument is the size of Sobel kernel used for find image gradients. By default it is 3. + Last argument is L2gradient which specifies the equation for finding gradient magnitude. 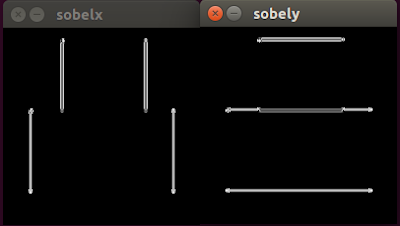 Write a small application to find the Canny edge detection whose threshold values can be varied using two trackbars. Consider example when searching face in an image, we are not sure what size the face will be present. So we will create a set of images with different resolution and search for face in all the images. These set of images with different resolution are called Image Pyramids (a stack with biggest image at bottom and smallest image at top). + Gaussian Pyramid : Higher level (Low resolution) is formed by removing consecutive rows and columns in Lower level (higher resolution) image. a M×N image becomes M/2×N/2 image. So area reduces to one-fourth of original area. It is called an Octave. 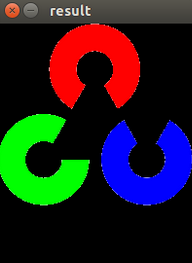 OpenCV provides cv2.pyrDown() and cv2.pyrUp() functions. 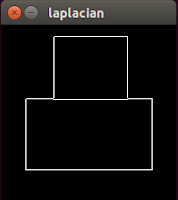 + Laplacian Pyramid : A level in Laplacian Pyramid is formed by the difference between that level in Gaussian Pyramid and expanded version of its upper level in Gaussian Pyramid. Laplacian pyramid images are like edge images only.